What is truly at stake in politics? Nothing less than how we should live, as individuals and as communities. 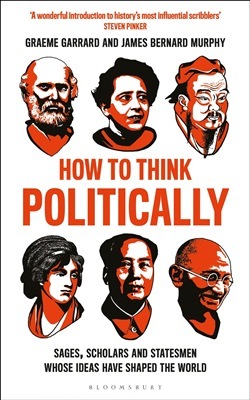 This book goes beyond the surface headlines, the fake news and the hysteria to explore the timeless questions posed and answers offered by a diverse group of the 30 greatest political thinkers who have ever lived. Are we political, economic, or religious animals? Should we live in small city-states, nations, or multinational empires? What values should politics promote? Should wealth be owned privately or in common? Do animals also have rights? There is no idea too radical for this global assortment of thinkers, which includes: Confucius; Plato; Augustine; Machiavelli; Burke; Wollstonecraft; Marx; Nietzsche; Gandhi; Qutb; Arendt; Nussbaum, Naess and Rawls. In each brief chapter, the authors paint a vivid portrait of these often prescient, always compelling political thinkers, showing how their ideas grew out of their own dramatic lives and times and evolved beyond them. Now more than ever we need to be reminded that politics can be a noble, inspiring and civilising art. And if we want to understand today's political world, we need to understand the foundations of politics and its architects. This is the perfect guide to both. Acquista How to Think Politically in Epub: dopo aver letto l’ebook How to Think Politically di Professor James Bernard Murphy... ti invitiamo a lasciarci una Recensione qui sotto: sarà utile agli utenti che non abbiano ancora letto questo libro e che vogliano avere delle opinioni altrui. L’opinione su di un libro è molto soggettiva e per questo leggere eventuali recensioni negative non ci dovrà frenare dall’acquisto, anzi dovrà spingerci ad acquistare il libro in fretta per poter dire la nostra ed eventualmente smentire quanto commentato da altri, contribuendo ad arricchire più possibile i commenti e dare sempre più spunti di confronto al pubblico online.